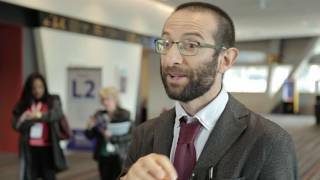 Paolo Bossi, MD of Fondazione IRCCS Istituto Nazionale dei Tumori, Milan, Italy discusses a MASCC 2016 workshop focused on mucositis management. The pre-clinical part of the workshop was focused on animal models of mucositis developed by Prof Stephen Sonis and the role of a photobiomodulation. Dr Bossi highlights the importance of basic oral care, as prevention is the first opportunity to give patients mucositis management when symptoms occur. Treating the painful impact of mucositis is also significant and medication should be tailored according to the patient. Recorded at the Multinational Association of Supportive Care in Cancer (MASCC) and International Society of Ocular Oncology (ISOO) 2016 Annual Meeting on Supportive Care in Cancer held in Adelaide, Australia.